The all-new Hallberg-Rassy 44 combines the best Hallberg-Rassy stands for, spiced with contemporary improvements for fast and comfortable cruising. The first boat will be finished the winter 2016-2017 and world premiere is at the world's largest boat show, Boot Dusseldorf 21-29 January 2017. You may order this new model now. You get a fixed price and a fixed delivery time. Hallberg-Rassy has always delivered on time, a promise held on over 9 200 boats delivered. 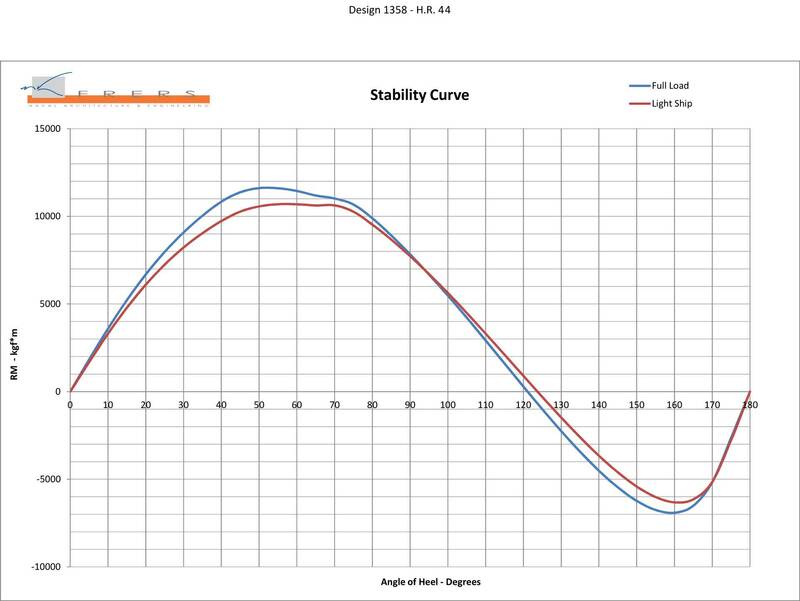 The twin rudders configuration gives a modern hull form ultimate control in all conditions, on all points of sail and the reduced load on each rudder increases the security of the system. The mechanical advantage of a single big wheel gives the helmsman control and feedback under sail, especially in tough weather. There is a winch on the starboard coaming in the cockpit. Ropes are hidden neatly, both excess lines aft of the clutches. In a storage box that is neatly hidden in the coaming, and between the clutches and the mast. If you have electric in-mast furling, you can control outhaul, vang, main halyard and code zero halyard from here. As tradition says, the cockpit of a Hallberg-Rassy is very well sheltered. The cockpit length is a generous 2.29 m, no less than 19 cm longer than on the 43 Mk III. The pedestal head has space for a good size modern chart plotter with multi function display. There is a large fold out bathing platform. As standard the platform folds out manually, optionally there is a push button operation available. When the platform is not in use, the transom is elegantly closed. The sailplan is modern. There is no need for any runners even with an optional cutter stay, either fixed with furler or detachable. The headsail is only slightly overlapping, making tacking easy. There is even a selftacking option. The jib furler is a Furlex TD with under deck drum. The deck layout is clean and uncluttered with under deck mounted electric windlass and all deck hatches flush mounted. The waterline is 12.88m, which is no less than 1.13 m longer than on the 43 Mk III. 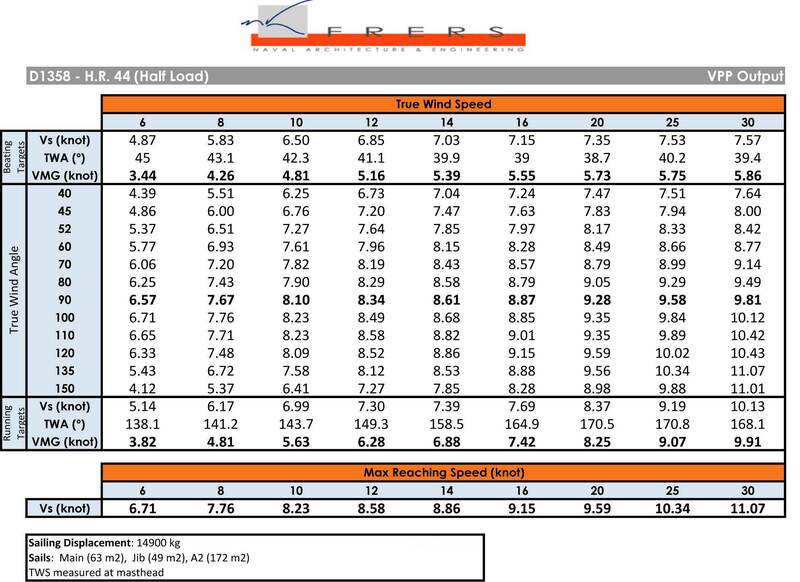 Frers speed prediction table tells that a loaded Hallberg-Rassy 44 will make 8.49 knots boat speed at 100 degrees in just 12 knots of true wind. There is a choice of the standard U shaped galley to starboard or the optional linear galley to port with large work top space on both sides of the galley. There are also options for freezer, micro wave, extractor fan with charcoal filter and even for a dish washer. 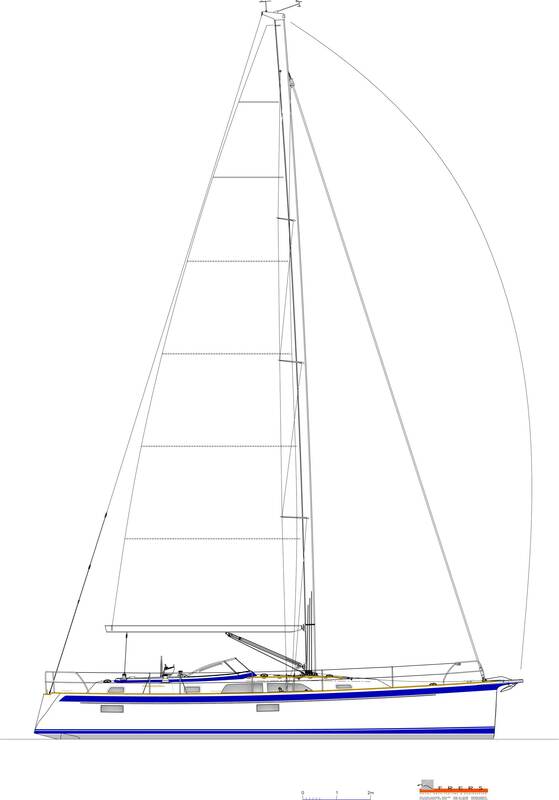 There are three options for the layout in front of the mast. One with a one cabin and two with a two cabin configuration. The standard layout has a big v cabin and a huge head with a separate shower with plexi glass doors and space for a washing machine. There is lots of locker space, two hanging lockers and a seat. There are two layout options with an extra cabin: One with the large heads and an extra twin bunks cabin to starboard, as well as the standard v cabin. Another available option is to have a separate passage to the v cabin and still a two bunks cabin to starboard. The forward heads in this version is not as large as the first two layouts mentioned. The aft cabin is generous for the size of boat and available in two versions; two individual berths with a wide sofa between, or an extra wide, comfortable centre line berth, with dressing table to starboard and a rounded seat to port. The aft heads is generous with a separate shower with plexi glass doors. There is an opening portlight towards the cockpit. There are six flush mounted deck hatches and eight opening portlights, as well as four hull portlights. The hull portlights are larger than those of other Hallberg-Rassys of this size of boat at Hallberg-Rassy. They are now as large as those on the flagship Hallberg-Rassy 64. All portlights and deck hatches have clear glass, except in the heads, which is milk coloured, to allow light in but obscure view into this department. This boat has lots of natural light and good ventilation throughout the interior. Hull length 13.68 m / 44' 11"
Maximum length 14.45 m / 47' 5"
Waterline at rest 12.88 m / 42' 3"
Beam 4.20 m / 13' 9"